In a nutshell, R.B.I. 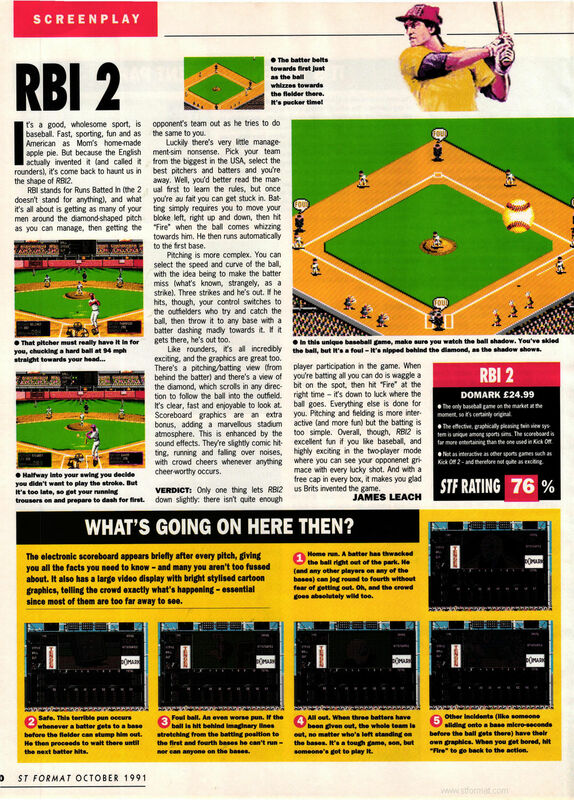 2 is one of the finest baseball games yet released (in fact one of the better sports sims of any type). One might even say it knocks the opponents for six... sorry, wrong country. Every aspect is easy to understand and easy to play. It doesn't matter whether it's batting, pitching or fielding. The graphics are not exactly outstanding, and sound is also adequate but nothing special. Still, it's fun to play, and in one player mode the computer is a more than adequate opponent. Not bad. Overall, though, RBI 2 is excellent fun in the two-player mode where you can see your opponent grimace with every lucky shot. And with a free cap in every box, it makes you glad us Brits invented the game. I must say, if you like Baseball games, RBI 2 Baseball is probably the best one on the market at the moment. However, if you're not really interested in Baseball, this polished Domark effort won't appeal to you at all. Unfortunately. I'm a member of the latter category and after a few minutes found the gameplay to be rather repetitive. There are some cute animations on the score board and there's a good "best of seven" two player mode. The team editor adds an essential function and breaks the potential monotony. Addictive if you're a baseball fan. Wieder einmal zeigt sich, daß ein paar nette Digisounds und einige Einfälle noch lange kein gutes Spiel machen. Bleiben wir also weiter beim Fußball. Als ob die Regeln nicht schon kompliziert wären, hat man den Joystick mit derart vielen Steuerbefehlen beladen, daß der Spieler hoffnungslos überfordert ist. Hier ist eine Übersichtskarte im Auge zu behalten, dort ein vergrößerter Ausschnitt des Spielfelds: Vor so viel Unübersichtlichkeit kapituliert der Baseball-Neuling, zumal alle Entscheidungen in Sekundenschnelle ausgeführt werden müssen. Lange Ladezeiten der unterschiedlichen Spielfeldperspektiven und ruckelndes Scrolling machen das traurige Bild komplett. Das ähnliche „Hardball“ gefällt mit deutlich besser als R.B.I. Baseball.